Welcome to our blog! Enjoy your stay! I'm so excited to share this make with you! For one, it's the first sewing related blog post on our new site... it broke months of hardly any sewing...AND it's a brand new pattern just released today! That's right. The Lou Box Dress 2 is officially available from Sew DIY! There's a 20% discount code (until Jan. 9th) on Sew DIY on the official announcement as well as a bundle discount! I used a faux coverstitch stitch pattern my sewing machine has for topstitching the neckband and hemming the sleeves. 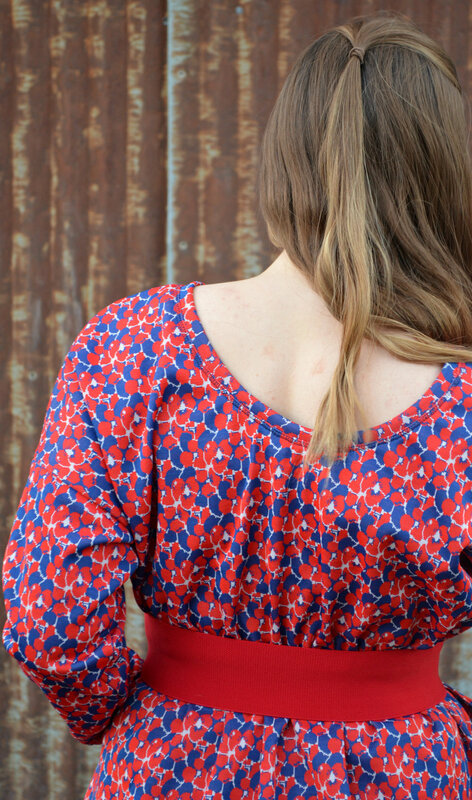 I had the lovely privilege of testing the Lou Box Dress 2 pattern for Beth and am thrilled to share my thoughts with you. ...and you should buy it. This version of the Lou Box Dress was made out of a vintage knit fabric from my grandmother. The fabric also makes the gathers bulkier but I actually like that for a winter dress! I'm basically wearing a sweater! Throw on some tights and I'm ready to meet the cold temps! I'm afraid my next version will be the complete opposite. Completely unacceptable for the below zero temperatures we're currently having. But why are we talking about my unfinished version?? The dress has a subtle low back (optional) and slightly gathered waist gives it a put together look but is still low maintenance to wear! I love the design lines of the Lou Box Dress 2 and can see many slowly curating themselves into my college wardrobe. Sign up with your email address to receive an email every time we have a new post! We respect your privacy and hate spam just as much as you do! We will never sell, give away or use your information for anything other than Jewberly Emiris' own email updates. Jewel is our amazing Sewist! She is currently in the process of earning her "Fashion Design & Technology" degree. She was diagnosed with Type 1 Diabetes at the age of 11, and is caramel color allergic, celiac and dairy free. Thank you! Be on the lookout for our next post!